This article is about the regular in-game camera. For the KopPad app, see KopPad. For the treasure, see Smile Detector. The camera is the viewpoint from which the player can see the action in a game's world. In the main Pikmin games, the camera can be adjusted by the player, in order to ensure that they can normally navigate through the areas and caves while being able to see what they're doing effectively. 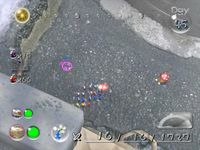 During normal gameplay, the camera is above ground level, pointing down, but some cutscenes move the camera automatically, as well as some tutorials and cinematic routes in Pikmin 3, such as the pathway leading up to a boss. Some sections and levels play out on a fully 2D view, with the camera at ground level to the side of the action. Thus is the case of the seesaw block section on the Garden of Hope. In Pikmin 3, the camera may also move up if there is an obstruction in the way blocking the view, like a plant, and when it needs to show a different section of the area when switching leaders, it first fades out from the current one and then fades in on the new area; this process pauses the game slightly. In Hey! Pikmin, the camera will simply follow where Captain Olimar is so that, whenever possible, he'll a always be in the center of the bottom screen. However, when cutscenes play the camera changes to focus on them. The camera at ground-level in Pikmin 2. There are a few controls that allow the player to manipulate the camera's direction. In the first two games, some extra controls change the camera's position as well, given that the GameCube and the Wii's visual outputs weren't deemed good enough to both get a large picture and allow the player to distinguish the finer details, such as their Pikmin. / can be used to rotate the camera sideways. When fully pressed, the camera faces the direction of the cursor in the GameCube games, and the direction of the leader in the Wii games. If the button is lightly or fully pressed, / can also be used to rotate the camera manually. In order to rotate the camera without moving the leader, / can be only partially tilted. By pressing / , the camera toggles between a 3/4 view and a top-down view. The former is preferred when the player wants to see more of what is ahead, whereas the latter is useful when there are several walls in the way. Pressing / causes the camera to toggle between the three available zoom values. The closest zoom value places the camera at roughly half of the regular distance from the leader, while the farthest zoom level places it at roughly twice the distance. When the button is pressed, the camera toggles happen in the following order: normal, far, close. For the first 100 plucked Pikmin in Pikmin, the camera temporarily switches to the zoomed in value whenever Captain Olimar is plucking them, and stays that way for a few seconds, before returning to the previous value. In Pikmin 2, / can be held down to make the camera switch to a ground level of altitude, after a second. This camera mode allows the player to see a lot of what is ahead, but not much of what is behind. Because of the new cursor in New Play Control! Pikmin 2, the player can call Pikmin from any place where the cursor can point on the screen. This means that, if the player uses this camera feature, they can whistle Pikmin from much farther away than normally possible. 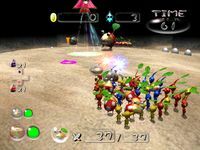 If the Pikmin are too far away to remain in the party, they will walk towards the leader when whistled, but instantly become idle when the whistle ends. The other leader, if whistled, will attempt to come to the current leader, and will only give up if he finds an obstacle. / / rotates the camera horizontally, and makes it face whichever way the cursor is facing with the GamePad and Pro Controller, and the direction the leader is facing while using the Wii Remote. Doing this also locks on the cursor. If locked-on to the ground, nothing special happens, but if locked-on to an enemy or object, it will cause the camera to zoom and rotate in such a way that it always shows the target and the current leader, until it is unlocked. The camera can also be rotated horizontally with / on the Wii U Pro Controller or GamePad, by holding a press near the left or right edges of the screen with the stylus controls, or by pointing at the left or right edges of the screen with the Wii Remote. When using the Wii Remote or the stylus mode, having the leader walk left or right will make the camera smoothly rotate in order to gradually show what is ahead of the leader. Much like the manual camera rotations, this automatic smooth rotation also doesn't make the leader change direction; the player must change their movement input so that it starts behaving according to the new camera angle. The camera's state has a direct impact on some gameplay mechanics. During normal play, the camera's angle decides which direction the leader or group will move to when the corresponding controls are used, in that holding "up" will move to the direction the camera is facing. The exception to this is in Pikmin 3, when the camera is rotated manually while a leader is moving, because the leader will continue going in the same direction until the control stick is released or held in a different direction. When locked-on, the movement, be it normal walking or using the dodge, always happens clockwise around the target when "right" is held, and counterclockwise when holding "left". But in the normal camera state, the direction of the dodge depends on the camera's angle. With the Wii Remote, the cursor can be aimed towards any location on the screen, so the camera's position is important in deciding what can and cannot be reached with the cursor, for purposes of whistling or locking-on. For instance, if the camera is set to the ground level, the whistle in New Play Control! Pikmin 2 can reach distances very far away, as explained above. And if the camera is facing an angle that puts the Stellar Extrusion on the Tropical Wilds in view, it is possible to order Winged Pikmin to fetch it with a charge; otherwise, the seesaw block nearby has to be used. In Bingo Battle, the Enemy Annihilator item kills all enemies that are visible on the player's screen. As such, the positioning of the camera will influence the outcome. Olimar's silhouette, in red, can be seen in the parts of his body that are obscured. In Pikmin and Pikmin 2, the camera is always centered on the current leader, to allow a consistent field of vision. 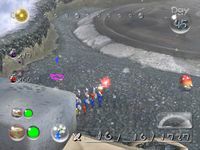 In Pikmin 3, Pikmin follow the leaders in a narrow line, and the camera always attempts to center itself so it can capture all of the line. This way, the maximum amount of Pikmin are always visible, but this can mean the leaders' view ahead is sometimes obscured. In New Play Control! Pikmin, New Play Control! Pikmin 2, and Pikmin 3, if a leader is behind the area's geometry or an object, from the camera's perspective, their obscured parts will be drawn as a solid silhouette, so the player can tell that the leader is behind that. Each leader's silhouette matches the leader's main color, like red for Captain Olimar, cyan for Alph, etc. Pikmin do not have this silhouette. In order to save resources, only elements visible by the camera are fully active. As such, the player can exploit this in order to render some enemies harmless. 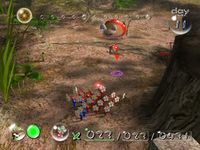 In Pikmin, enemies have three rough states of activation. If they are visible on-camera, they are fully active, and act like normal. If they're outside of the camera's view, but still close, they will only be rendered and processed every other frame. 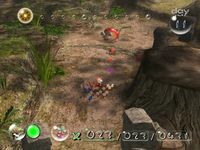 This becomes apparent with tools such as a free camera mode in emulators, although it is possible to tell that enemies are only processed at half speed by listening: one can approach a sleeping Red Bulborb or Spotty Bulbear, put them in sight of the camera, and take note of the interval between snores. Then, by leaving the enemy just outside of the camera's reach, it is possible to hear the snores come half as frequently. One can also tell that objects are rendered every other frame by keeping a damaged Pellet Posy on the bottom of the screen while the camera is zoomed in to the closest method, and then moving forward until the plant is off-camera, but the health wheel is still visible – the wheel will blink rapidly. The third state is when an enemy is completely disabled. By being off-camera and far away (at least around the size of a Red Bulborb past the camera), the enemy will not be rendered nor processed – effectively, the enemy is frozen in time until it is approached again. This can be seen with, for instance, a Yellow Wollywog staying in mid-air if the player leaves mid-jump, and only landing when the player finally goes near it again. Pellet Posy pellets will also not change color while off-camera. 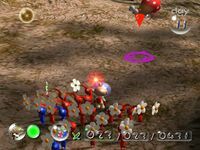 In Pikmin 2, bomb rocks in a cluster that blow up off-screen will not ignite the neighboring bomb rocks. Also in Pikmin 2, Gatling Groinks and Spotty Bulbears will always be fully functional, even if off-camera. KopPad view, after taking a picture. This page was last edited on March 1, 2019, at 08:52.